North Carolina still finds the thrill of going to the NCAA Tournament and holding a high seed. Iona is happy to be included as well, entered for the fourth straight year. The teams meet in the first round Friday night in Midwest Region action in Columbus, Ohio. North Carolina is in its 50th NCAA Tournament. The Tar Heels are a No. 1 regional seed for a record 17th time. "It's special to be a No. 1 seed," coach Roy Williams said. "The most special thing is to see the way our kids reacted when they saw our name as a No. 1 seed, and they put North Carolina up there. I just love the way they were genuinely excited. ... We're playing in the NCAA Tournament, and people think we've had a pretty good year." Iona (17-15) didn't look much like an NCAA Tournament team for a chunk of the season. But the Gaels own a 10-game winning streak, holding the top seed and winning three times in the Metro Atlantic Athletic Conference tournament. The final of those came against Monmouth, which is coached by former North Carolina point guard King Rice. Now the task appears more difficult. "It's a great opportunity to play against one of the best teams in the country," Gaels coach Tim Cluess said. "I got to watch them on TV the other night against Duke, and we look forward to the challenge." The Gaels ought to know something about that. Cluess is taking the team to the tournament for the sixth time in eight years. Last year, it was a first-round meeting with Duke. "You've got to be better for two hours, and everything has to break your way," Cluess said. "You've got to believe you have a chance when it's March. That's what makes basketball fun. "(North Carolina is) a loaded team, a great basketball team, coached extremely well, that we obviously know. Size-wise they're going to be a challenge. Speed-wise they're a challenge." Iona's winning streak followed a four-game losing skid. North Carolina hasn't lost consecutive games this season, and the only way that would happen is if it falls to the Gaels on Friday night. Williams' teams, counting his time at Kansas, are 28-0 in first-round games. 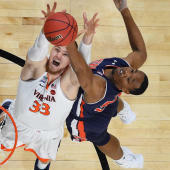 North Carolina has tangled with elite teams in the Atlantic Coast Conference, including three meetings in barely more than a three-week span against Duke, which was dubbed the NCAA Tournament's overall No. 1 seed. The Tar Heels won two of those matchups, though fell by one point in the ACC tournament semifinal last Friday. But the Tar Heels have only two losses in the last 17 games. "We've enjoyed some good moments, and we've had some difficult ones," Williams said. "But at the same time, I love the excitement." Williams said the Tar Heels have played with the right mindset during the past two months after a humbling blowout home loss to Louisville in January. He doesn't want a drop-off in intensity now. "I think a couple of things are really simple," Williams said. "We have to respect everyone and fear no one. We have to be ready to play the first day. If you play your tail off the first day, perhaps they'll let you stay around and play somebody else." North Carolina is 3-1 all-time against Iona, winning the last meeting in November 2007 as part of the Las Vegas Invitational. This is the first clash in the NCAA Tournament. The Iona-North Carolina winner goes against the Utah State-Washington winner in Sunday's second round.